It already feels like Spring/Summer here in the Bay Area and crochet is one of my all time favorite materials for clothing. I adore this white crochet dress from Dailylook, it is super light and airy. Don't forget to enter into Lulu*s Galentine's Giveaway for a chance to win a dress every month this year and my Caper giveaway for a chance to win a rain caper! Dress: Lucca Couture Crochet Dress thanks to DailyLook, here. Steal: Lucca Couture Crochet Dress from DailyLook, here. Splurge: Swinging 60's Dress from Free People, here. Jacket: Rebecca Denim Jacket from Abercrombie & Fitch, here. Steal: Ripped Denim Jacket from Forever 21, here. Splurge: Rebecca Denim Jacket from Abercrombie & Fitch, here. Steal: Personalized 14k Gold Necklace from Walmart, here. Splurge: 18k Gold Plate Script Name Necklace from Zales, here. Bracelets: Crystal Double Rhombus Bangle thanks to Rings & Tings, here. Steal: Crystal Double Rhombus Bangle from Rings & Tings, here. Splurge: Kate Spade New York Putting On The Ritz Bangle, here. Bag: Indigo Uber Clutch thanks to GiGi New York, here. Steal: Vieta Foldover Roll Clutch from Nordstrom, here. 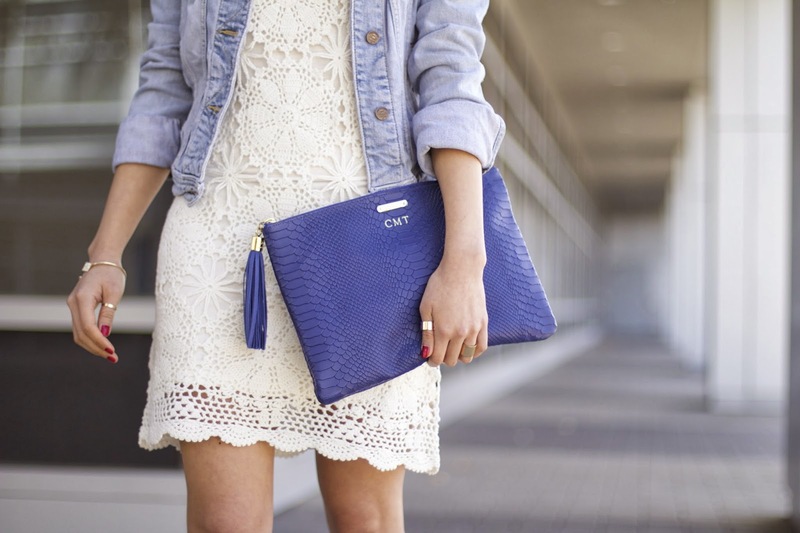 Splurge: Indigo Uber Clutch from GiGi New York, here. Steal: Chinese Laundry Janes Way Cage Heels, here. Splurge: Dolce Vita 'Hettie' Leather Sandal from Nordstrom, here. Below are the items I tested and my honest opinions about each of them. I hope you guys find it useful and comment below if you have any questions! This blush is amazing! 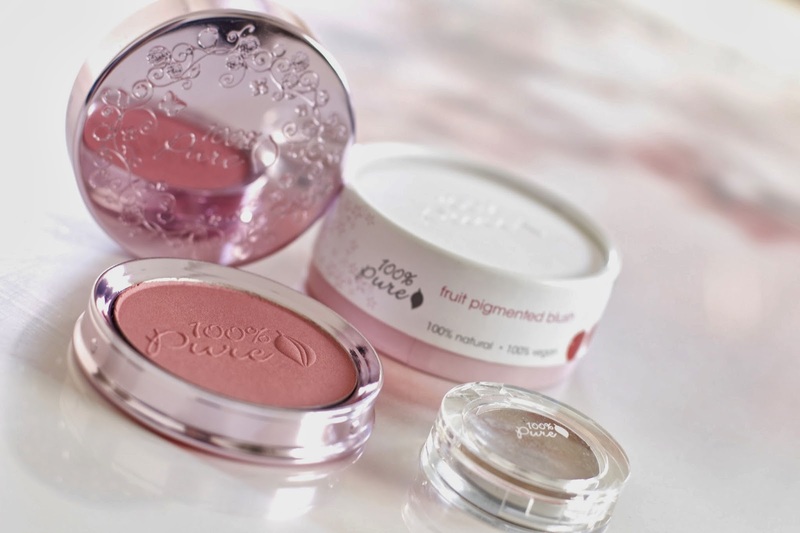 It looks natural and leaves a really pretty shimmer, a little goes a long way with this blush. 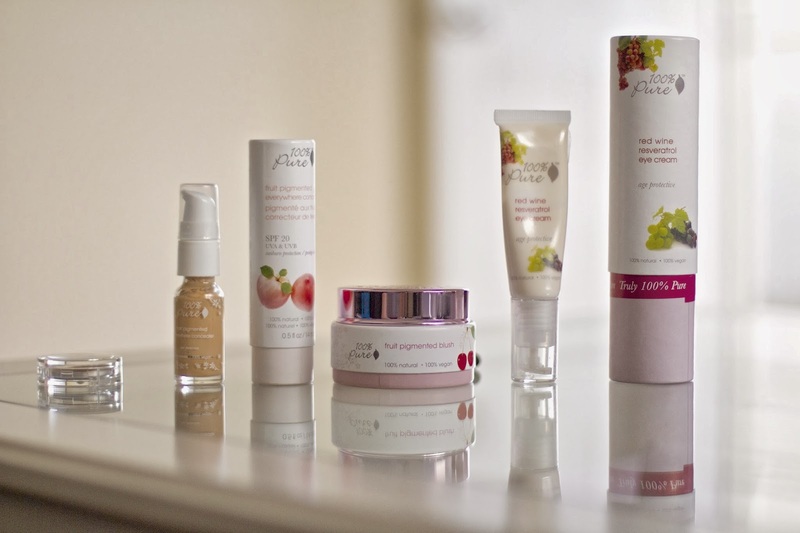 If you're looking for a new blush and want to try something new and healthy, try this blush! It also comes in a ton of different shades, see here. Many eye brow powders that I have used in the past have an eye-shadow powder texture, but this one is a powder gel that helps the product last longer. Unfortunately, it comes in only two colors and this one doesn't match my eyebrows as nicely as Anatasia Beverly Hills Brow Powder Duo. But once they add more colors, this eye brow powder gel will be a good one to get! 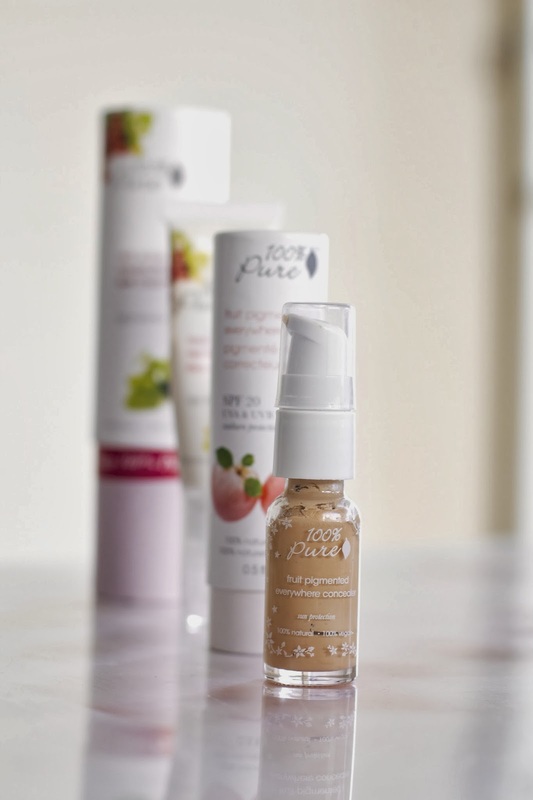 Need a concealer to cover up imperfections? This concealer is creamy and gives a light coverage. With all of the different types of concealers I've used, I would categorize this one as a "wet" concealer that leaves your face dewy and fresh looking. :) I have really dark circles around my eyes and need more coverage (I currently use Urban Decay 24/7 Concealer Pencil), but if you are looking for a light concealer, this is a good one to try. 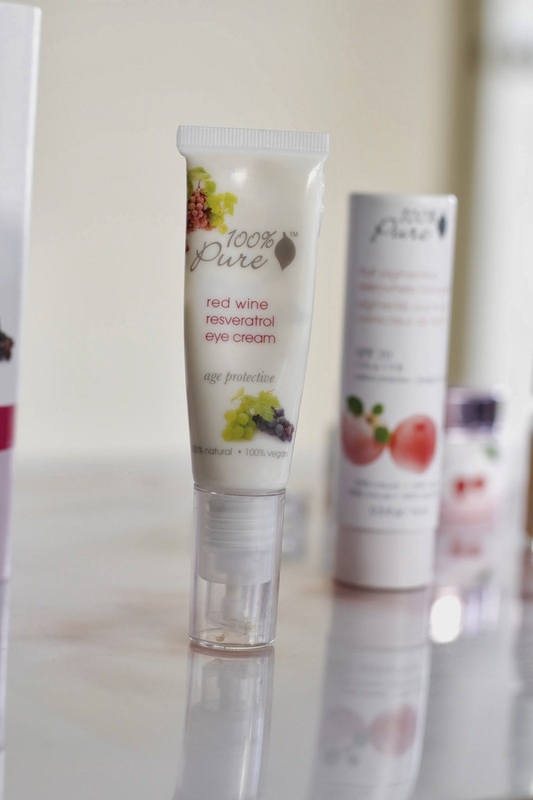 This eye cream is jam packed with antioxidants and vitamins! I only use 1/2 pumps for both eyes and it really leaves my eyes feeling super refreshed and moisturized. After using it for 2 weeks, my eyes are firmer and less puffy. Love it! 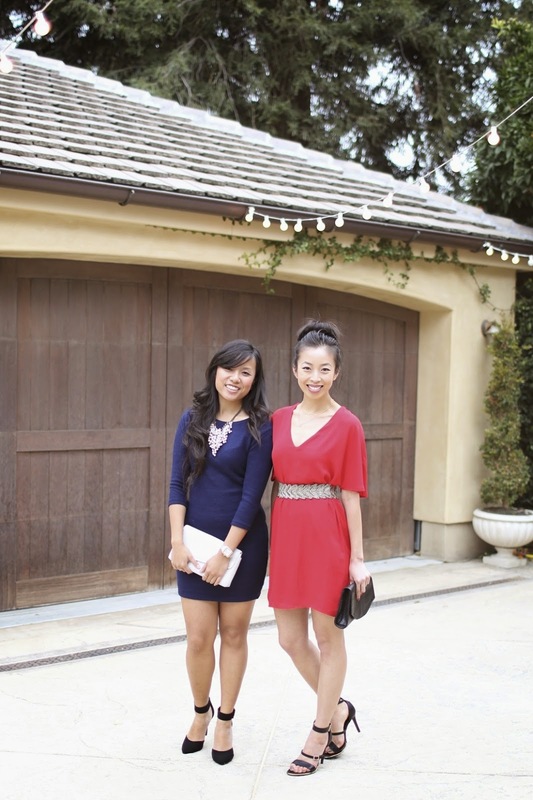 This is Alex's and my second look for Lulu*s Galentine's day giveaway! Our first look was more casual and daytime. 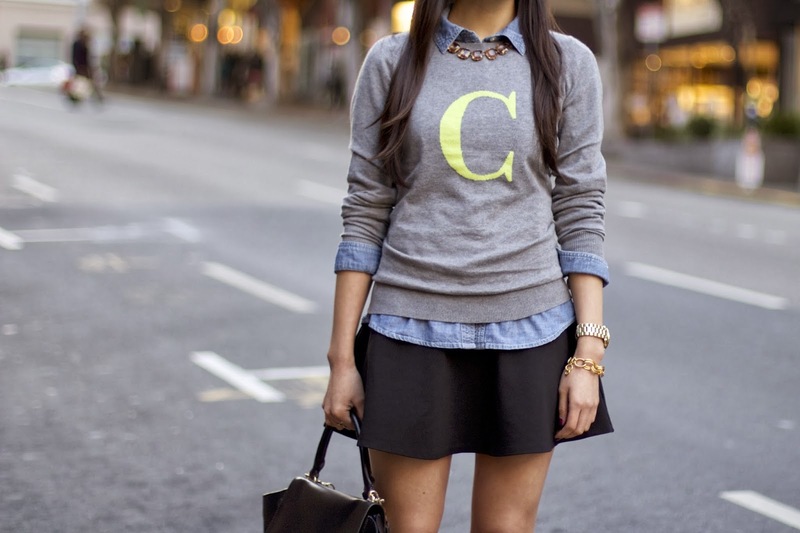 This pairing is more dressy and nighttime appropriate! Valentine’s day may be coming up quick but here at LuLu*s, Galentine’s day reigns supreme!! Forget the flowers and treat yourself to a year of fresh frocks! LuLu*s is giving away one free dress a month to one lucky gal (and her best pal) for all of 2014! Follow the link to enter and refer your best gal pal with your custom generated link for a chance to WIN: http://bit.ly/dressesforayear!! Lulu*s Galentine's Day giveaway is open now until Feb. 12th, 2014 and the winner will be announced by Lulu*s on Feb 15th, 2014. On Me: Rise From the Sashes Red Dress thanks to Lulu*s, here. On Alex: The Sooner the Sweater Navy Blue Sweater Dress thanks to Lulu*s, here. On Me: Gold Initial Necklace Two Squares Personalize and Circle Gold Eternal Hammered Necklace thanks to Thought Blossoms. On Me: Grand Together Gold Rhinestone Bracelet thanks to Lulu*s, here. On Alex: MICHELE Two Tone Watch, here. On Me: Volary Wines Belt from Anthropologie, here. On Me: Alexa Clutch thanks to JJ Winters, here. On Me: Shoe Republic LA Gemini Black Ankle Strap Heels thanks to Lulu*s, here. Splurge: Mixx Shuz Nicki Black Pointed D'Orsay Kitten Heels thanks to Lulu*s, here. In addition to Lulu*s Galentine's giveaway, I have another fun new giveaway that starts today with Caper! Caper is a brand that makes cute, colorful, and fashionable rain capes! Their capes are so cute, you'll want to wear one when it is not even raining! See below for details on how to enter to win a cape in any color of your choice. 1. Like Rain Caper on Facebook, here. 2. Follow Connnietang on Facebook, here. 3. Leave a comment below with your name and email address for me to contact you. All 3 steps must be completed in order to qualify for this giveaway. Entries will be accepted until 02/04/2014 at 12:00 AM PST and is open to all US residents. One winner will be randomly selected and notified via email. Blazer: Sleek Suit Blazer from Banana Republic, here. 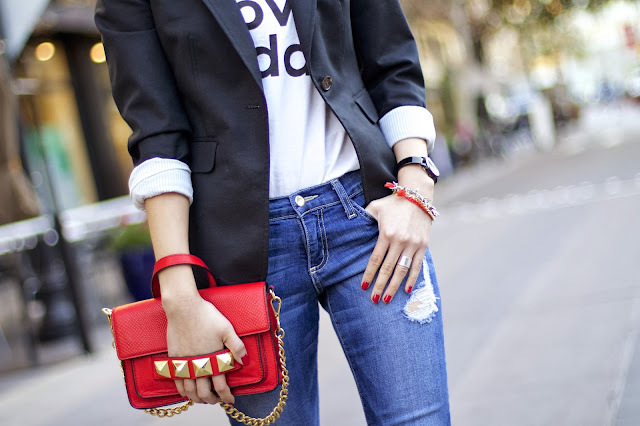 Steal: Signature Blazer from Forever 21, here. Splurge: Sleek Suit Blazer from Banana Republic, here. 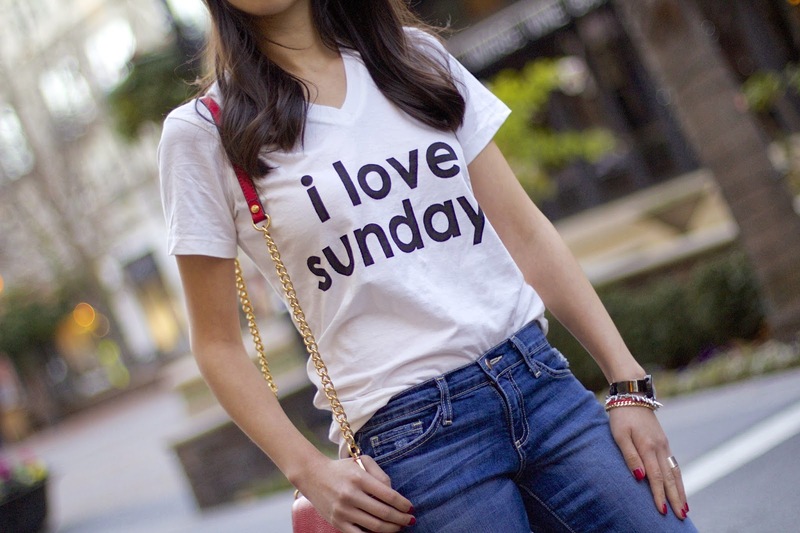 Shirt: I Love Sundays Pima V-Neck Tee thanks to Peace Love World, here. Steal: Geek Chic Tank from DailyLook, here. Splurge: I Love Sundays Pima V-Neck Tee from Peace Love World, here. Steal: Vigoss Destroyed Skinny Jeans from Nordstrom, here. Splurge: Gap 1969 Legging Jeans, here. Bracelets: Lisa in Red thanks to Thesis of Alexandria, here. Renegade Cluster Bracelet from Stella & Dot, here. Steal: Modernist Layered and Sweet Side Curb Chain Bracelet from Forever 21. Splurge: Lisa in Red from Thesis of Alexandria, here. Renegade Cluster Bracelet from Stella & Dot, here. Ring: Sterling Stamped Personalized Ring thanks to Thought Blossoms, here. Steal: Topshop Smooth Band Rings Set, here. Splurge: Sterling Stamped Personalized Ring from Thought Blossoms, here. Steal: Sophisticate Structured Crossbody from Forever 21, here. Steal: Anne Michelle Perton-17 Ankle Strap Sandal from ZOOSHOO, here. Splurge: Aubrey Red Platform Sandal from Sole Society, here. 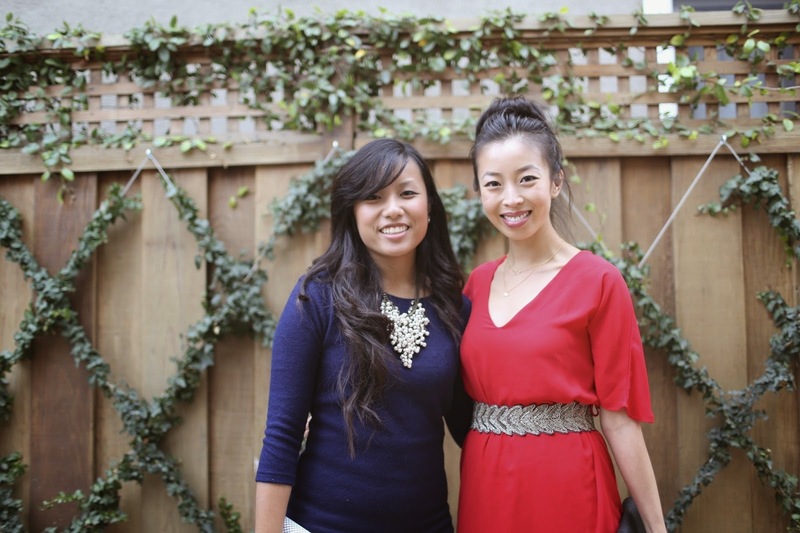 I had the pleasure of collaborating with Alex from snippetswithalex (check out her blog!) 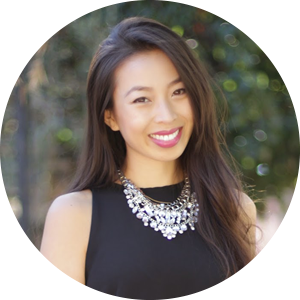 on this fun Lulu*s giveaway! She has amazing style and is super fun! If you love thrifting and Anthropologie, you'll love Alex's blog. I first met Alex through my bff, they are cousins, and I cannot express how amazing she is. We spent 99% of this photo shoot laughing and joking around. This is our first Galentine's Day pairing and a second one will be up next week. On Me: A Sight To Be Seam Royal Blue Skater Dress thanks to Lulu*s, here. On Alex: That's a Wrap Burgundy Polka Dot Long Sleeve Dress thanks to Lulu*s, here. On Me: Sunny Side Strut Grey and Yellow Necklace thanks to Lulu*s, here. On Alex: Just My Typewriter Gold Necklace thanks to Lulu*s, here. On Me: Catching Fire Yellow Rhinestone Cuff thanks to Lulu*s, here. On Me: Glint 'Anaconda' Metal Clutch from Nordstrom, here. On Alex: White Gold All In One Bag from GiGi New York, here. On Me: Shoe Republic Mustard Snake and Suede High Heels thanks to Lulu*s, here. Splurge: Anne Michelle Spiral 11 Black and Gold Cutout Pointed Pumps thanks to Lulu*s, here. I learned an interesting and fun fact today, kissing prevents cavities! It also can prevent cramps, headaches, and lower blood pressure. I read it on CNN (here) and immediately sent it over to my other half asking to be kissed more often. He lives in San Francisco and I live in San Jose, so we only see each other on the weekends and I cherish every moment we spend together. Also, can you believe that Valentines Day is only a month away! Sweater: Pop Color Crew-Neck Sweater from Old Navy, here. 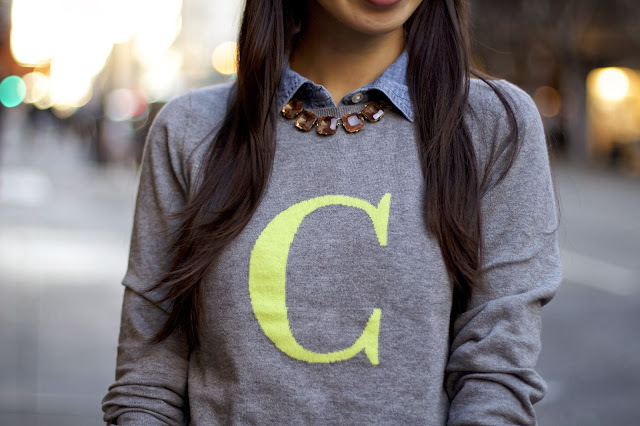 Steal: Pop Color Crew-Neck Sweater from Old Navy, here. Splurge: Halogen 'Letterman' Sweater from Nordstrom, here. Shirt: Chambray Shirt from Old Navy, here. Steal: Life In Progress Acid Wash Shirt from Forever 21, here. Splurge: Chambray Shirt from Old Navy, here. Splurge: High Waisted Pleat Front Skirt from The Limited, here. Steal: Standout Layered Bead Necklace from Forever 21, here. Splurge: Sahara Gem Statement Necklace from Benevolent Jewels, here. Bracelets: Harmonia Nautical Linked Chain Bracelet thanks to QQLemon, here. Steal: Street-Chic Braided Chain Bracelet from Forever 21, here. Splurge: Harmonia Nautical Linked Chain Bracelet from QQLemon, here. Purse: Caterina Purse thanks to Cuore & Pelle, here. Splurge: Caterina Purse from Cuore & Pelle, here. I wore this when we went to Vegas the other weekend, it is a chic city look that is perfect for shopping, sight seeing, or to lunch. I am obsessed with this Linea Pelle Grayson bag, so I apologize for using it over and over in recent (and upcoming) posts, it just goes with almost anything! I hope everyone had an amazing weekend and I would like to congratulate Chaela C. for winning my Pink Slate Boutique giveaway! Sweater: Honeycomb-Knit Sweater from Old Navy, here. Steal: Xhilaration Juniors Pullover Sweater from Target, here. Splurge: Honeycomb-Knit Sweater from Old Navy, here. Tee: Perfect Stripe Tee from Old Navy, here. Steal: Perfect Stripe Tee from Old Navy, here. Splurge: Essential Striped 3/4 Sleeve Top from Forever 21, here. Jeans: Mid Rise Distressed Denim thanks to ShopAKIRA, here. Splurge: Mid Rise Distressed Denim from ShopAKIRA, here. Bracelet: Jessica Multitexture Bracelet in Gold thanks to QQLemon, here. 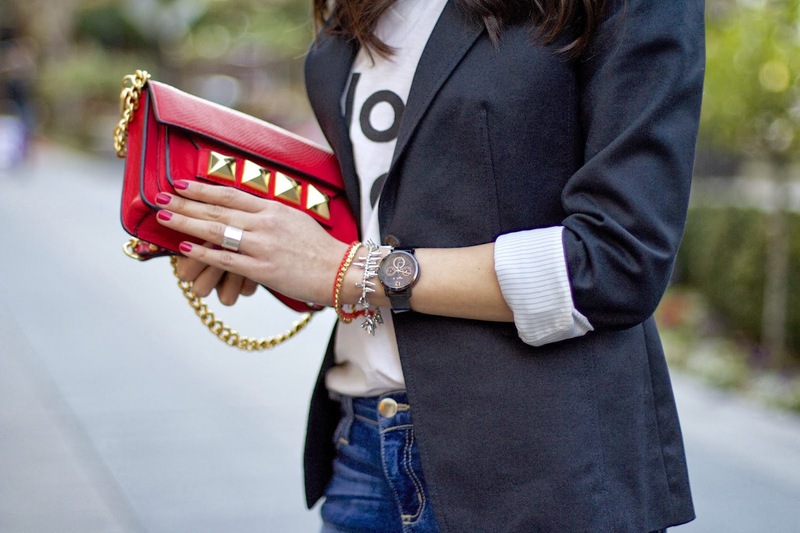 Steal: Cutout Craze Link Bracelet from Forever 21, here. Splurge: Jessica Multitexture Bracelet in Gold thanks to QQLemon, here. Rings: Double Band Ring Set thanks to DailyLook, here. Minimal Ring thanks to Rings & Tings, here. Steal: Earthy Wreath Midi Ring Set and Simple Stated Midi Ring Set from Forever 21. Splurge: Double Band Ring Set from DailyLook, here. Minimal Ring from Rings & Tings, here. 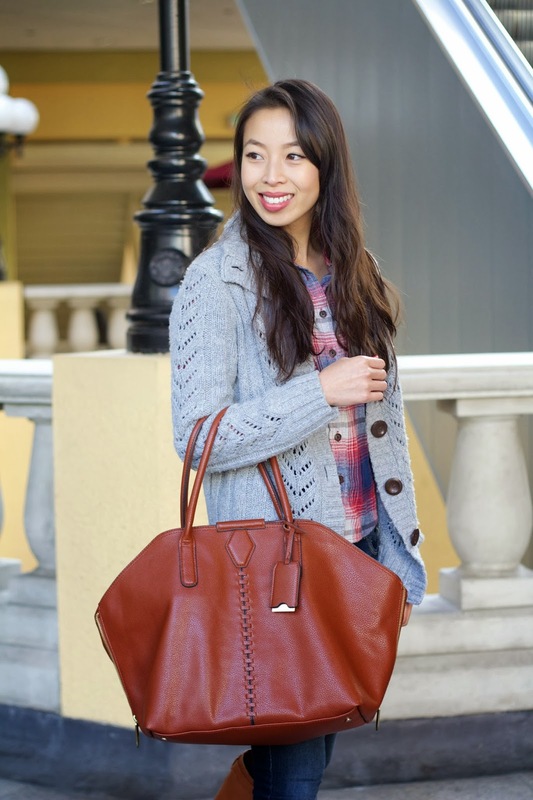 Steal: Aimee Kestenberg 'Kiera' Crossbody Bag, here. Steal: Ivanka Trump Leelas Baby Tiger Pump from 6pm, here. Splurge: Lousie et Cie 'Jenniy' Pump from Nordstrom, here. I hope everyone has an amazing weekend! I am still confirming details from a winner and will announce the winner in my next blog post. 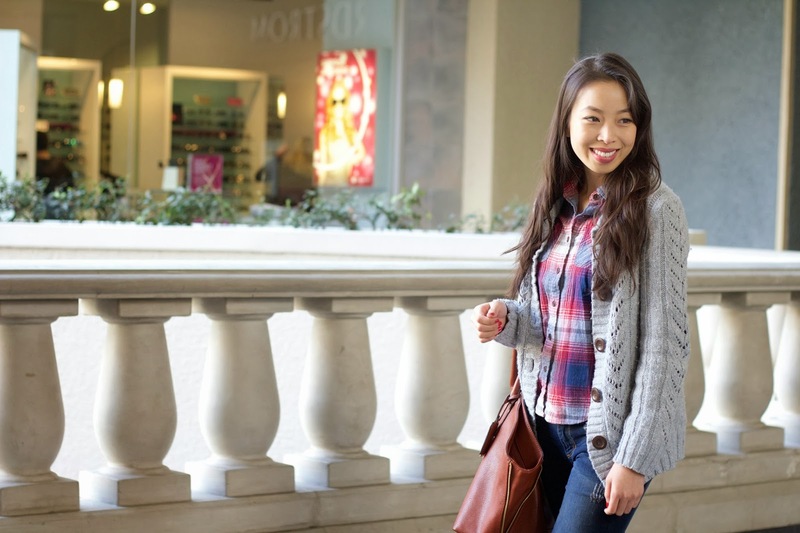 Steal: Honeycomb Boucle Cardigan from Forever 21, here. 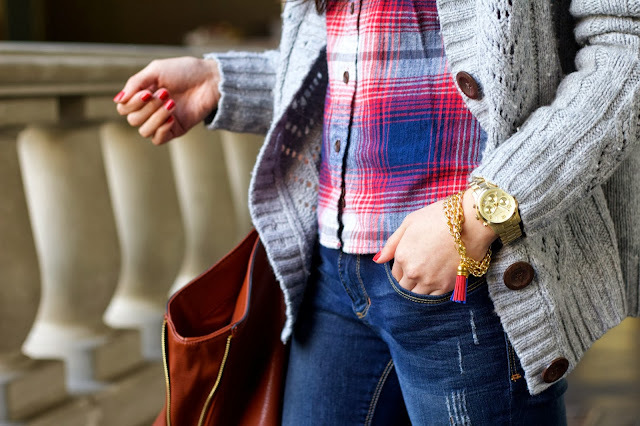 Splurge: Chunky Cable-Knit Open Cardigan from Banana Republic, here. Steal: Real Soft Epic Flannel Shirt from American Eagle, here. Splurge: Checkmarked Buttondown Shirt from Anthropologie, here. Jeans: Cropped Blue Distressed Skinny Jean thanks to GJG Denim, here. 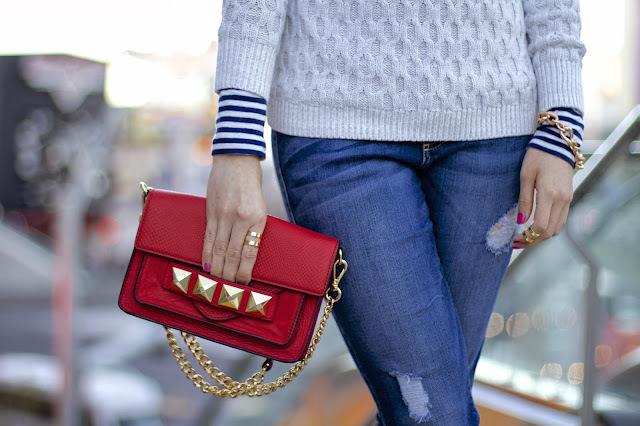 Steal: The Rockstar Mid-Rise Super Skinny Jeans from Old Navy, here. Splurge: Cropped Blue Distressed Skinny Jean thanks to GJG Denim, here. Bracelets: Red & Blue Alyssa Tassel Bracelet thanks to Cathryn Ann, here. Steal: Tassel Macrame Bracelet from Nordstrom, here. Steal: MICHAEL Michael Kors 'Selma' Medium Leather Shoulder Bag, here. Shoes: Turn-Lock Leather Riding Boots from C. Wonder, here. Steal: Merona Kimberely Tall Elastic Boots from Target, here. 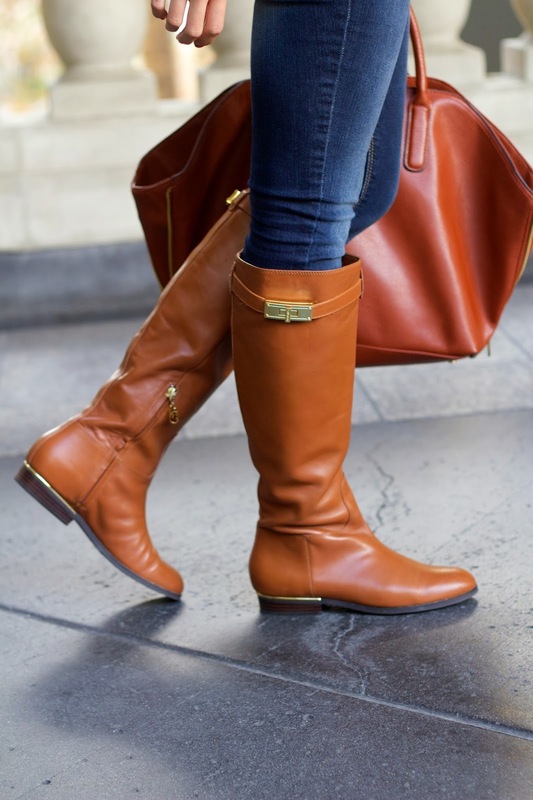 Splurge: Turn-Lock Leather Riding Boots from C. Wonder, here.